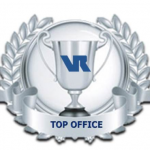 At VR Business Brokers Charlotte, NC, we strive to provide the highest level of professionalism and customer service. Our team has received numerous awards for our dedication to professionalism and determination to close deals. Below are just a few of our office’s most recent awards.